Bear Island Conservancy is a small, 317 hectare protected area on the shores of Babine Lake. The conservancy was established in 2008 after recommendation from the Morice Land and Resource Management Plan. The conservancy encompasses approximately 4 km of lakeshore and two islands (Bear & Cub). Part of the conservancy was a former Forest Service recreation site. 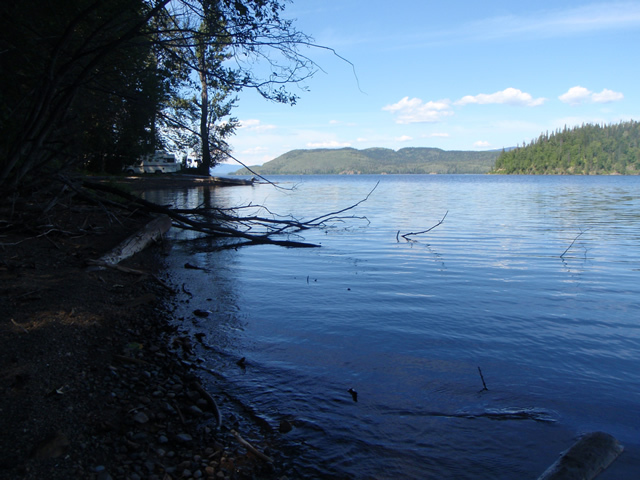 This site continues to be maintained as a vehicle accessible campground popular with people who enjoy fishing on Babine Lake, especially during the August Sockeye fishery. The road into the campground is a steep gravel road. Under some conditions, large RVs may have difficulty getting back up the road. The conservancy campground is in a wilderness area that is also home to bears. Please keep a clean campsite and educate yourself on bear safety. Bear Island Conservancy is located approximately 5 km north of the Village of Granisle on the shores of Babine Lake and is 60 km east of Smithers. From the Village of Granisle, head north for 4.5 km on Topley Landing Road (gravel road along Babine Lake). Turn right and follow the campground road for about 200m to the campground. Nearest communities: Granisle, Topley, Smithers, Houston, and Burns Lake. Cultural Heritage: This conservancy lies within the traditional territory of the Nat’oot’en Nation. Boating on Babine Lake is a popular activity. Babine Lake is a large lake that can rapidly develop large waves. Small boats should use caution if venturing far from shore. There is no boat launch at this conservancy, but a public boat launch is available at Granisle. The conservancy does have good landing sites for boats. Babine Lake is a large, cold lake. Swimming is usually limited to the warmest months of the year (July & August). The main wildlife viewing opportunity is birding along the lakeshore or on the islands. Campfires are permitted. While fires are allowed, we encourage visitors to conserve the environment by minimizing the use of fire and using stoves instead. Campfire rings are provided at each campsite. Visitors must provide their own firewood. Please do not collect firewood from inside the Conservancy. There is no designated day-use/picnic area, but visitors are welcome to picnic in unoccupied campsites. This park offers vehicle accessible campsites on a first-come, first-served basis – campsite reservations are not accepted. Camping is available in the snow-free season (May through October). There are 6 rustic campsites, all within 100m of the lake.